Here’s something a bit more challenging for you to make. 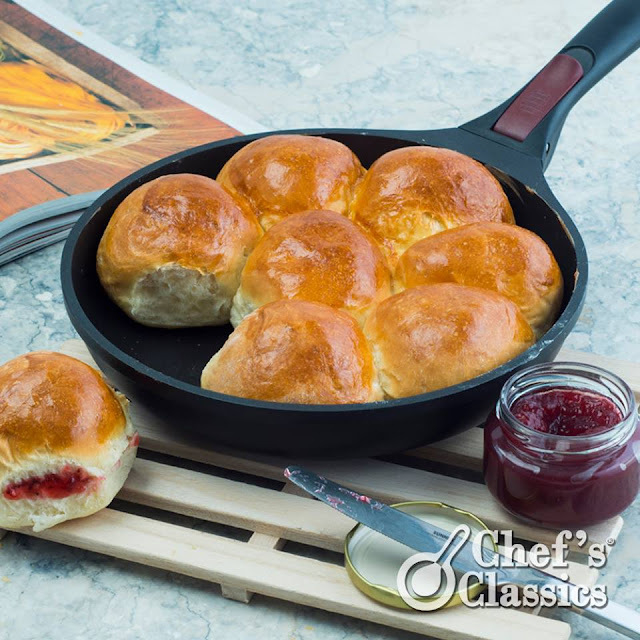 Don’t worry – this homemade bread rolls will surely be a hit when you serve them. Time to get baking! 1. In a large bowl, combine the yeast, warm water and a pinch of sugar. Let it sit for 3 minutes and stir. 2. Mix in the milk, the remaining sugar, the salt and the melted butter. 3. Gradually add the flour and mix until the dough is formed into a ball. 4. Knead the dough for 8- 10 minutes until smooth and elastic. 5. Place the dough in a bowl and cover with plastic. Set it aside and let rise until doubled in size. 6. Punch down the dough and divide it into 18-20 pieces. 7. Roll the dough into balls and place on a baking pan lined with parchment paper. 8. Cover the rolls with towel and let them rise again for 30 to 45 minutes. 9. Whisk together the egg and water to make an egg wash. Brush it on the rolls. 10. Bake them in a pre-heated 420F oven for 15 minutes or until golden brown.